The eosinophilic fasciitis (EF) is a rare scleroderma-like disorder, characterised by the sudden onset of symmetrical painful, tender, oedematous and erythematous extremities with progressive thickening of the skin and soft tissues. The diagnosis of EF is often based on the association of cutaneous abnormalities with histological examination showing a thickened fascia with an inflammatory infiltration constituted by lymphocytes and eosinophils. Peripheral eosinophilia is common at least at the early stages but not mandatory for the diagnosis. Imaging is under development; ultrasound but mostly magnetic resonance imaging than can objectify fascia involvement with signal enhancement after gadolinium administration can be of value. 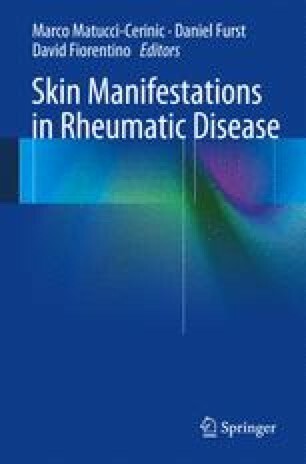 Differential diagnoses are mainly systemic sclerosis, localised scleroderma, inflammatory myositis, hypereosinophilic syndromes, eosinophilia–myalgia syndrome after l-tryptophan exposure and graft versus host disease. Despite the scarcity of this condition and lacking clinical trials, there is substantial agreement among published cases or case series that corticosteroids, initially at high dose (more than 20 mg prednisone/day and often 0.5–1 mg/kg as a starting dose), are the first-line treatment. Methotrexate seems to be the first-line immunosuppressive drug given in addition to corticosteroids or for some authors only in case of an unsatisfactory response to corticosteroids alone. For refractory diseases, other immunosuppressive drugs may be offered after ruling out associated neoplasia.